Rejoice Always. Not sometimes, not in the good moments, but always (1 Thessalonians 5:16, HCSB). Ann Voskamp's book, One Thousand Gifts, reminds us that God is seen even in the smallest of things, the sweet smeel of pumpkin cooking, the sound of rain on window panes, those moments when your babies actually play peacefully with one another. Some days, some seasons are definitely harder than others. Sometimes I have to seek out the reasons to be thankful. To remind myself of all the good in my life. Negativity comes so easily, so naturally. Positivity takes work. So today, I'm thankful for the love between my children. Emma is so, so sweet with her little brother. Smothering sweet at times, but I love it just the same. I love watching their relationship develop. How big Ezra's smile gets when his big sister talks to him. How cute they were, on my bed this morning, looking at a book together. 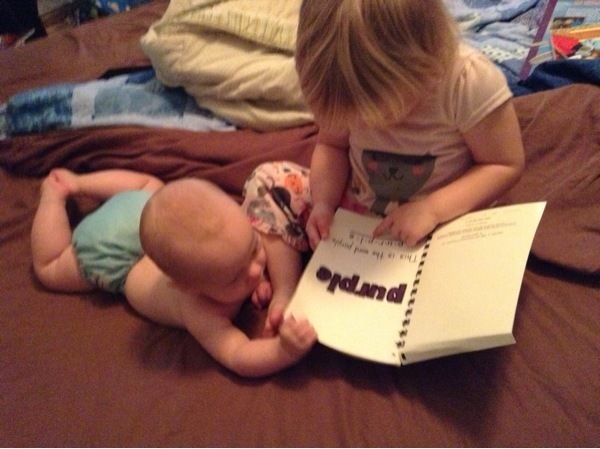 Emma was pretending to read the book, while Ezra watched her so contentedly. These are the moments I want to remember. The moments that my heart records for all time. "But Mary was treasuring up all these things in her heart and meditating on them" (Luke 2:19, HCSB). That's what I do with my babies. Sometimes, it helps to stand back and simply be thankful. To let the stress drop off and treasure up the moments. There's a song by Scotty McCreery, Dirty Dishes, that's often on repeat in our house. It's such a great reminder of thankfulness in the midst of seemingly chaos. If you haven't heard this song, check it out, it's a great one. The mother in the song has such a wonderful take on thankfulness. It all comes down to perspective. The late hours the husband works, cluttered house, and noisy children can either be points of contention, or points of thankfulness. The mother in the song has her heart in the right place. The husband's job means that they're provided for, there's food on the table, and her kids are growing up healthy and strong. I love her point of view. It's such a great reminder, for me, to be thankful each day. To look at our crazy life and be thankful. Thankful for the clutter, for children who want to be held, who even throw tantrums at times. Because this is the life God gave me. Who am I to say otherwise? And so, today I rejoice. Rejoice for the beautiful morning we had, and rejoice in whatever this afternoon may hold.